I could use some graphics (buildings, traps, effects, gore...) and skins (zombies, robots / terminators / new monsters etc). Wanna help? Can you please upload it at an other hoster, e.g. mediafire.com? You can upload releases to Github, you need to do 'git tag 0.0.1' then 'git push --tags' then go to https://github.com/Siile/Ninslash/releases and attach your Windows binaries files to the newly created source archive. Thanks for reporting. I'll set github repo for binaries when I release the next version (during weekend). Mediafire was cool maybe at 2009, but now it's just crappy ad-filled virus-sharing website with 1Kb/sec download speed. There are so many better alternatives, even 4shared.com is better, but if you don't want to create another account, share it from your Google Drive or Dropbox. Or just host the files on the forum, like this. can pass them, but can we also use melee weapons on them while sliding? Are you kidding me? This is still ninslash.com! I CANT DOWNLOAD IT! PLEASE UPLOAD IT ON MEDIAFIRE, GOOGLE DRIVE, DROPBOX OR IN THIS FORUM OR 4SHARED, but PLEASE NOT on ninslash.com! Could please someone from US tell me the ping you have? Yesterday while testing some new features I noticed a player hosting a Teeworlds city mod in Ninslash. Too tight spots for player to pass, and bots had no idea what to do or how to move, but fun experiment never the less. Thanks! The turret graphics are from nodes, and I'm trying to include some of it's best part to Ninslash. Instead of just dropping down full turrets, I've taken a bit different route. Players can collect construction kits (mostly as loot from NPC monsters) and build them from parts. Turret will need a base / bottom part and a stand / main frame (2 construction kits). After that you can just drop / put your weapon to turret, and it's done. Not yet sure if I should put some ammo limit and refill system, or just give them infinite ammo with low fire rate for simplicity. Some of the building parts / starts will be shared between different buildings, so you can ruin your teammate's epic plan by completing his construction to be something else that he had in mind. This sounds cool! If you decide to go with a ammo limit and refill system You could make an ammo drop just for turrets. that way your not using your ammo and no matter what you can refill any turret. You should have an ammo bar above the turret so that people know when it is about to become empty. Not sure who should be able to see this. Just the person who set it up, their team, or everyone. But when turrets don't have any ammo they should slowly lower their weapon as though they are deactivating and waiting to be refilled. that way the players know that it has no ammo and needs to be refilled. also I don't know if you got my message the last time we talked(everyone just kinda left the game). When your player has caught fire from a flamethrower or any other way you can catch fire. The fire should be extinguished if they player roles on the ground from falling from high. 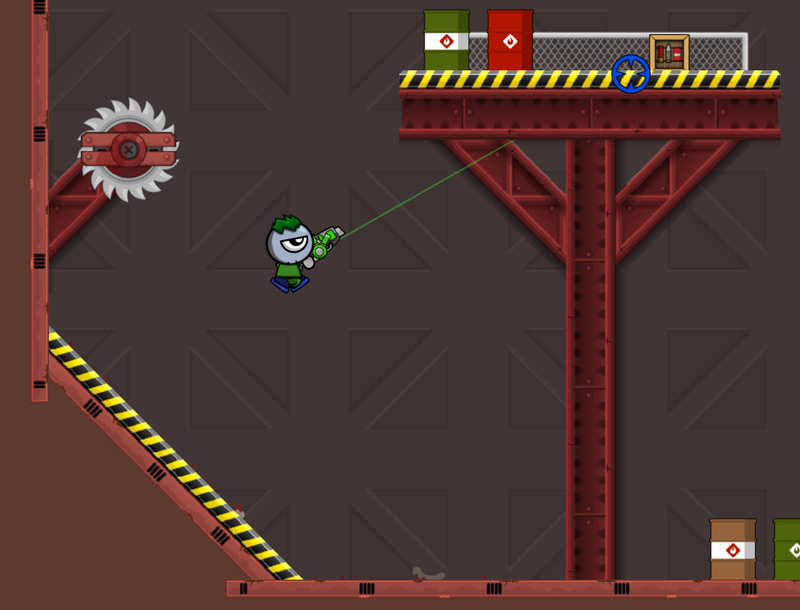 I finished the shooting part of turrets yesterday, and they're way too OP without ammo limit. There are couple of ways to do the ammo filling, I'll try out which works best. Health & ammo bars are a must. The fire should be extinguished if they player roles on the ground from falling from high. I got your message and adjusted the fire a bit. Rolling burns the flame faster, but doesn't extinguish it instantly. You can now build by collecting kits (tool boxes) from map. 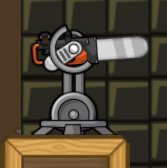 Use wrench and weapon selector (default key e), build turret stands and drop your weapon to stand to make a working killing machine. I'll add more enjoyable GUI for crafting / building in next versions. CTF has some critical bugs when carrying flag and changing team, I'll fix them soon, but in the mean while try DM & Infection. Infection still best with server setting sv_preferredteamsize 15. Map grinder3 has some kits for building. 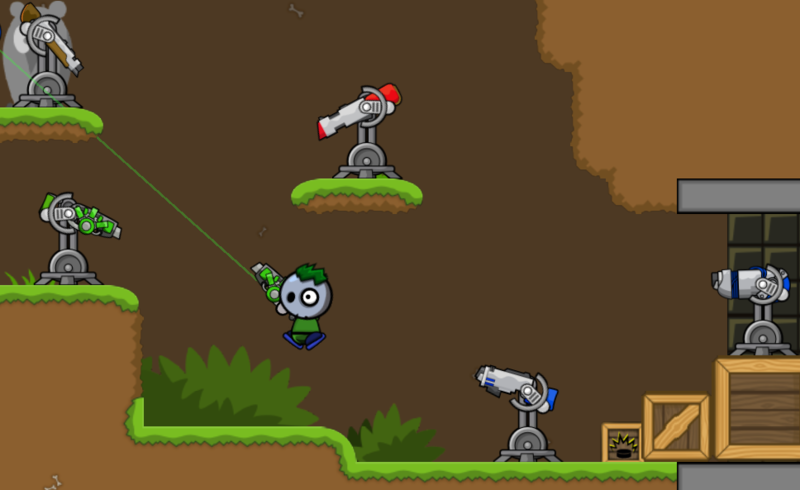 Try Ninslash, have fun and tell me what you think! Testing new tiles, far from perfect. Anyone wanna help me with coding? I could use good looking liquid (poison & lava pools) and modular map generation (combining two or more small maps into a single map). Since Ninslash requires shaders anyway, I guess something like this should work, it could be slow though.